Definition - What does Half Camel Pose mean? Half camel pose is a kneeling asana that opens and stretches the upper body while stimulating the digestive and respiratory systems. 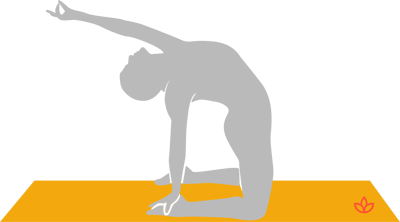 It is a modified version of camel pose and an effective backbend. To enter half camel pose, begin seated on the heels. Keeping the knees hips-width distance apart, come upright onto both knees. Place the hands with the fingers pointed downward onto the lower back. Inhaling, press the toes and knees into the mat while extending through the crown of the head. Push the hips forward on the exhale. Mindfully lower the right hand to the heels. Extend the left arm and hand out and up. Looking toward the sky, expand through the chest, lengthening the upper back and spine. Hold for three to six breaths then release the pose by lowering the hips to the feet, coming to a seated posture. Repeat on the opposite side. The Sanskrit name for half camel pose is ardha ustrasana. Much like ustrasana, half camel is an excellent pose for stretching and strengthening the entire back of the body. It is also a powerful heart opener and, as such, helps to open the heart chakra. For those with knee pain, a folded yoga mat or blanket under the knees is recommended.